Alternate title: How I cured my insomnia. FO REALS! I used to be a terrible sleeper. For all of high school and most of college I had trouble falling asleep (for HOURS), staying asleep (I’d wake up for hours at a time), and feeling rested. No matter how exhausted I was, or how healthy I ate, or how much I exercised — I just couldn’t sleep. Luckily: That all changed! There were many contributing factors, I’m sure, but in this post I’ve listed five that I think are the most important for me personally. Insomnia definitely differs from person to person, but hopefully these are useful tips or a new approach to try for some of you! This may seem obvious, but for me it has been the #1 tool for falling asleep. I’ve found that my meditation practice helps (a ton) me more effectively quiet my mind when I’m ready to go to sleep. I let myself wind down and think about the day, but then there comes a point where I basically start meditation: I clear my mind as much as possible — I stop analyzing, planning, ruminating, etc. — and focus on my breathing. Sometimes I focus on the feeling of air going past my nostrils, or sometimes I repeat (silently) “In, out. In, out.” as I breathe. Usually this puts me right to sleep. I can pinpoint when I started sleeping better in my early 20s, and it most definitely coincides with switching to sleeping on a high quality mattress! I realized I needed something firm enough (personal style, not saying that’s the ticket) that my body wouldn’t get uncomfortable or feel claustrophobic. 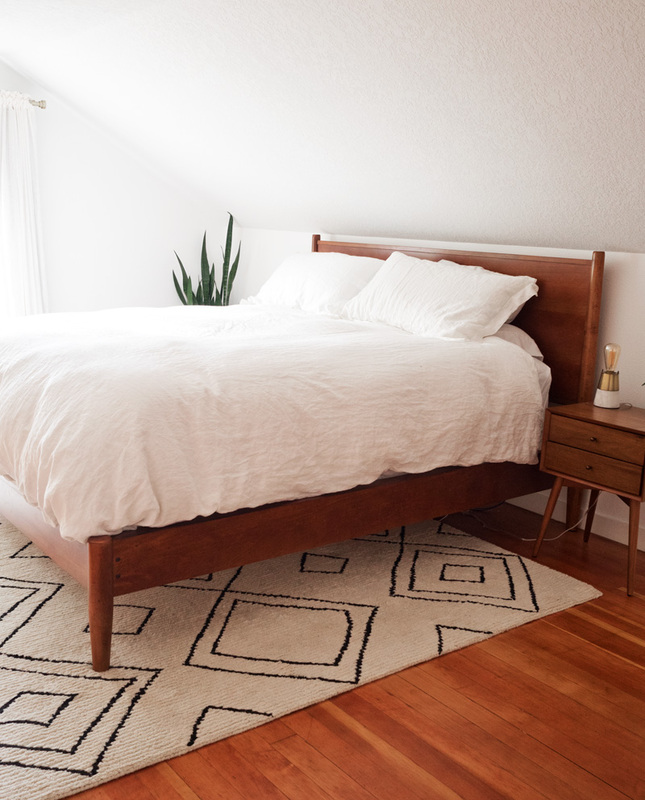 After our recent move, we decided to upgrade our mattress: we got a new Brentwood Homes Oceano Mattress in a CALIFORNIA KING! AAAH! Even though I’m a total snuggler, having the extra space (for when I really do want to sleep) is wonderful. They delivered the mattress (in a box! it was so easy to fit through doors and up stairs! ), and then we just had to unpack it and put it on our bed frame. We’re thrilled with it! 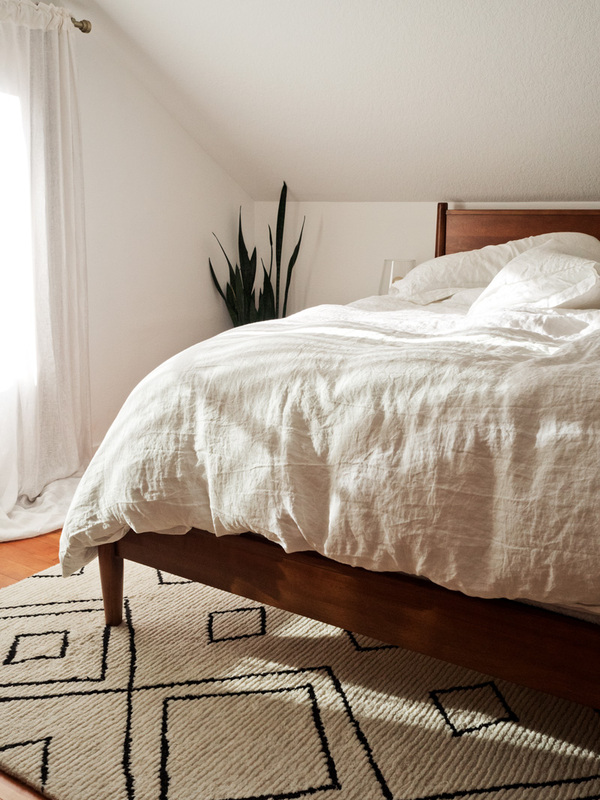 We were a bit hesitant at first when buying it because we weren’t sure what size we needed but we just checked this guide for mattress sizes and turns out we were correct! Of course, buying a brand new mattress can get pretty expensive, especially if you’re getting a large one like us. There are plenty of coupons and discounts online which will help you save a bit of money. My friend recently found a deal for Saatva and she saved a lot of money! It’s worth shopping around to get the best price. If you want to protect your new mattress, you may consider getting yourself some new mattress toppers like this. I thought I was sleeping really well already, but when we got a noise machine 18 months ago: omg. MIND BLOWN. It was such a game changer! I can’t handle any recorded sounds (fire crackling, fake raindrops, etc. all get distracting because I can hear the loop! ), but the straight up white noise is PERFECT. Or a fan, if you’re a fan person! Same story with getting the room dark: I thought it was dark, but then got blackout curtains. WOW. Huge difference! Ever heard of a second wind? If you’re trying to fall asleep, but you’ve pushed past being sleepy and are into your second wind — it’s gonna be difficult. Listen to your body — it starts letting you know it’s sleepy by releasing melatonin (which helps you fall asleep). It expects you to use that boost of melatonin to actually get to sleep, so it only releases melatonin for a short while. DON’T MISS YOUR CHANCE! This may mean adjusting your schedule to figure out what your natural rhythm really is. For me, this is usually 9:15-9:30pm — not ideal, honestly, but something I’ve learned to own and have no shame about. I go to bed early, and I do it so I feel good! Some yoga traditions have a physical (asana) practice for the express purpose of being able to sit comfortably in meditation. That means the entire point of stretching and strengthening and working out the kinks is so you’re comfortable in stillness. I think the same applies for sleeping. If you’re physically uncomfortable in your body, it will be harder to sleep. This will look very different depending on your body, and it’s specific discomforts, but for a lot of us: stretching out (or going to yoga) for a short time every day can go a long ways towards making your body feel relaxed and comfortable. Maybe a massage is more up your ally, or something challenging like running or rock climbing! This is a bonus, since I know it sounds a little weird. When I’m having a particularly hard time falling asleep, I try to imagine the feeling of falling asleep: my brain feels like it’s getting further away, and my eyes get heavier and heavier in their sockets, and I can feel myself slipping into sleep. I seriously conjure that feeling up out of nowhere and STICK TO IT (in addition to doing the other things on this list), and it works. I fall asleep. Hallelujah! This list is what works for me, but I suspect we probably have a lot of overlap! I know there can be an overload of information you’re struggling with insomnia — don’t feel like you need to do every single tip. I’d pick one or two and try them out for a week. See how it goes, and let me know! PS — FINAL thought: I used to try to nap a lot. I wasn’t very good at it, but it did give me enough rest that then I couldn’t sleep at night. It’s so tempting to “catch up” while you can in the afternoon, but (for me) it was a vicious cycle. I think it’s worth playing around with not napping, to see if you can get your body on a nighttime sleep schedule! I received a mattress from Brentwood Home, but all opinions are my own. Thank you for supporting the brands who keep The Kitchen Paper up and running! I have such a hard time quieting my mind at night. A good book always does the job for me! What a beautiful bed. I may buy the Crystal Cove bed (I need A LOT of support and don’t like ANY sinking into a mattress). Have you been a long time Brentwood Homes Mattress owner? Can you tell me how long the mattress seems to last before it starts sinking (and needs replaced)? I too have trouble getting to sleep. We unplugged our wifi and I got rid of the cordless phones too (I had EMR blocking technology on ALL of it but somehow it still seemed to be disruptive) and I really DO seem to be sleeping MUCH deeper and so far having less trouble getting to sleep too. 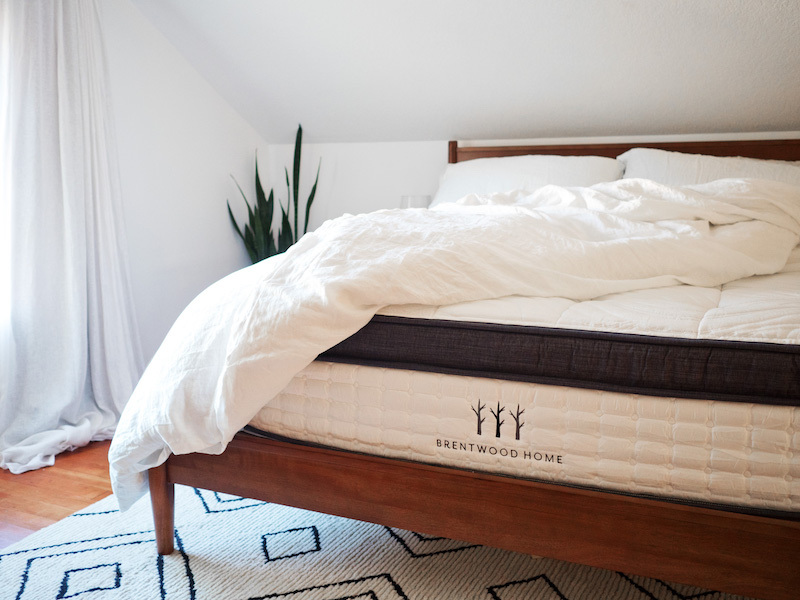 Please reply about the Brentwood Home mattresses, I would like to know more about them. Hi Ann! I’ve only had this one for about three months, but so far so good! I haven’t noticed any sagging. They do have a 25-year limited warranty which includes 2″ indentations (read their policy for actual details there)!